Two new magazines are in UK stores now, both with a specific musical bent, but with items of particular interest to us all as they have interviews with various members of Nick Mason's Saucerful Of Secrets. The band have had a reasonable bit of coverage recently in various magazines, but these more specialist publications delve a little deeper into some aspects (in a very accessible way to non-players). 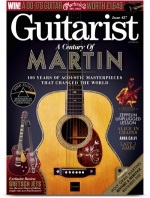 First, the September 2018 issue of Guitarist (issue 437, far left) has, alongside a major feature on Martin acoustic guitars, a look at "Nick Mason on recreating Syd's guitar tones". This is covered in a nice, eight page article, interviewing Lee Harris, Gary Kemp, and Nick Mason (is it a first for him appearing in this magazine?). The article is a fascinating insight into how the band came together, and how the material was developed for the set list. You can order this magazine online, worldwide, through this direct link to the publisher's own eStore. 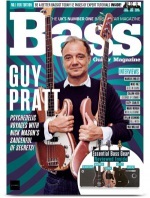 The other magazine of note is September 2018's Bass Guitar Magazine (issue 160, left) which has Guy Pratt on the cover, holding two of his basses, and backed with the Saucerful swirl design. The five page article is an absorbing look into the project, with the interview also covering Guy's long and diverse career in music. As with Guitarist, above, you can order this magazine online, worldwide, through this direct link.